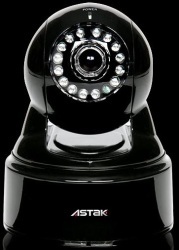 Designed to work without a dedicated PC, the new Astak Mole was announced today. The Mole is a wireless webcam that can upload video directly to such sites as YouTube, Facebook, or Twitter. It can also record directly to an SD card in the camera. I’m curious however, exactly who will be using this product, and for what. It can be controlled remotely (even pan and tilt) via a web interface, has 15 LEDs for night time recording, and a two way microphone so the person being filmed can have a conversation with the viewer. The internet feed to the camera comes via either an ethernet port, or an internal wifi card. Recording quality is pretty standard, with the high quality mode set at 640×480. The camera can also be set to a motion sensitivity mode, and capture movement as it happens, and record it for later. The obvious usage is for home or small business security, this sounds like something that Biggs would be into given his quest for a home monitoring solution. The website suggests that it would also make a good baby monitor, which certainly sounds reasonable. The Mole cam will ship early this November for $299.